The Queen has received a £5million rise in funds she receives from the taxpayer to carry out her official duties. The Sovereign Grant, which covers the running costs of the Queen’s Household, replaces the Civil List and is up 16 per cent on 2012. It has been set at £36.1million for the 2013/14 financial year. The figure has increased from the £31million allocated during the previous 12 months which included £1million to cover the extra costs of the Diamond Jubilee. The Sovereign Grant replaces the old funding system of the Civil List and grants-in-aid and came into full effect at the start of the new financial year which began yesterday. It also covers the maintenance of the royal palaces in England and the cost of royal travel for official engagements in the UK and overseas tours. The Crown Estate’s 2011/12 accounts revealed profits of £240.2million and the final figure for the grant was rounded up to £36.1million – very close to the estimated amount – by the Royal Trustees in December. Royal accounts released last year showed the cost to the taxpayer of supporting the monarchy rose marginally during 2011/12. 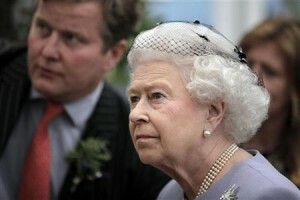 The Queen’s official expenditure increased from £32.1million in 2010/11 to £32.3million in 2011/12. Around £10million is spent on the salaries of the Queen’s staff, from footmen to chefs in the royal kitchen – but wages have been frozen for a number of years. The figure for official expenditure does not include the cost of providing security and police protection for members of the monarchy. A Buckingham Palace spokesman stressed that the £36.1million sovereign grant awarded for this financial year was 15 per cent less in real terms than the royal household’s expenditure five years ago. He said during this period the household reduced its expenditure in line with reductions in funding. Because of this, key building and conservation works were postponed, resulting in a maintenance backlog. The spokesman said the majority of the grant would therefore be spent on addressing the backlog of property works which need to be undertaken across the occupied royal palaces. The money pays for the maintenance of Buckingham Palace, St James’s Palace, Clarence House, Marlborough House Mews. It is also used for the upkeep of parts of Kensington Palace, Windsor Castle and the buildings in the Home and Great Parks at Windsor, and Hampton Court Mews and Paddocks.